Yesterday, U.S. DOT did something it hadn’t done for a decade: submit a surface transportation authorization bill to Congress. And what a bill it is. The $302 billion, four-year GROW AMERICA Act has several major reforms that would shift federal policy in a more multi-modal direction. One big change that we’ve noted before is that transit would get a bigger slice of the pie, but there are several other new proposals worth a look. Before our overview, a caveat: President Obama’s funding plan — although it may align with that of the head tax man in the Republican House — has already been dismissed as a political non-starter. And Democratic Senator Barbara Boxer has indicated she’s not in the mood for major policy changes this go-round. So, take this bill for what it is: a blueprint of the administration’s vision and a menu of options that, in an ideal scenario, Congress would pick and choose from in crafting the bill. Changes the Highway Trust Fund into a multi-modal Transportation Trust Fund. The bill would replace the current system’s highway-centric orientation, which shunts transit funding off to the side, with a truly multi-modal trust fund. It would include not just highways and transit but also intercity rail (which has long been marginalized in a separate bill and funded with unpredictable general funds) and the popular TIGER grant program (which has a history of funding innovative, multi-modal projects). The TTF would also include the New Starts/Small Starts transit grant program, which has historically been funded with general funds, separately from the trust fund. Makes TIGER permanent and creates a new competitive grant program. TIGER would get $5 billion total over four years and no longer have to fight for its place in an appropriations bill every year. The GROW AMERICA Act also calls for a new program called FAST (Fixing and Accelerating Surface Transportation). FAST seeks to spread what U.S. 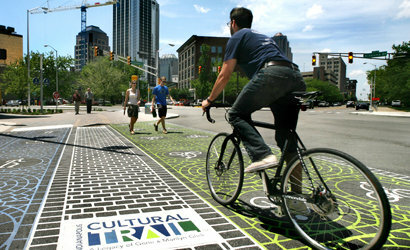 DOT considers to be “best practices,” including the integration of transportation planning with land use and economic development, as well as funding mechanisms that “convey the full social cost of travel decisions to users” and giving local governments the authority to raise funding for transportation — which some cities have struggled with for years. Indianapolis, for instance, had to fight hard to get authority from the Indiana legislature to go directly to voters for more transportation funding. The FAST program would further these best practices and be funded at $1 billion annually. Focuses squarely on multimodal transportation. Forgive me for this inside-baseball point, but historically, the highway section has been Title I of every transportation bill. But this time, Title I is Transportation Infrastructure Initiatives — an array of items that cut across modes, everything from changing the process of environmental reviews to strengthening planning agencies. Highways are now Title II. Freight is re-envisioned as multi-modal. MAP-21 gave some attention to the freight system, but the freight network it designated consists exclusively of highways. The GROW AMERICA Act calls for a competitive grant program for freight that cuts across modes. Exempts rail and transit from some historic and environmental preservation rules. The law that established the U.S. DOT in 1966 put severe restrictions on the use of publicly-owned parks, wildlife refuges, and historical sites, both public and private. With an increased emphasis on accelerating transportation projects in recent years, this section of the law — 4(f) — has come under fire. In this bill, U.S. DOT exempts some rail, transit and bridge projects from the measure. As the administration looks for ways to speed up projects without endangering the useful aspects of environmental review, starting with transit is smart. Doesn’t offer a revenue proposal. President Obama unveiled his plan to fund transportation with corporate tax reform two months ago, but that’s not actually included in the bill. That may be for the best, though. John Robert Smith of Transportation for America told reporters yesterday that the corporate tax proposal isn’t a sound way to fund transportation. “We must have long-term funding for transportation for the future,” he said. “We can’t resort to just a one-time thing.” Maud Daudon, president and CEO of the Seattle Metropolitan Chamber of Commerce agreed. “For long-term economic prosperity, you can’t have a short-term funding strategy for major infrastructure,” she said. “It just doesn’t make any sense.” The bill calls for $87 billion in spending over and above what the Transportation Trust Fund is expected to be able to pay for. Doesn’t return bike and pedestrian funding to former levels. The Transportation Alternatives Program gets a few little tweaks, like allowing nonprofits (which often administer Safe Routes to School programs) to apply for funds, and it allows applicants to group small projects together to meet the minimum for an 80 percent federal contribution. But the bill does not return dedicated walking and biking funds to former levels. In its analysis, the Bike League notes that the bill doesn’t create a national bike plan, doesn’t establish a separate bike-ped performance measure, and fails to set aside some TIFIA loan money for bike and pedestrian programs in low-income communities. Doesn’t expand on performance measures or national goals. MAP-21 was widely lauded for beginning to implement performance measures for states, though as we’ve often mentioned, the bill didn’t have much teeth in this respect. States set their own targets and can often miss them with impunity. This bill doesn’t appear to advance the role that performance metrics play in federal incentives. One day, perhaps safety and efficiency will be bedrock principles of our national transportation policy, but this bill doesn’t do that. What did we miss in our analysis? If there are major changes and notable provisions in the administration’s proposal that we missed, let us know in the comments. Looks relatively good, considering the constraints of a GOP House preventing comprehensive reform. And it’s worth remembering that the Transportation Republicans aren’t always the same as the broader caucus – a lot of people from commuter rail suburbs around Chi and Philly – so hostility to transit isn’t a given. Also, the tolling changes are a smart move for getting things passed – there’s a lot of libertarian love for funding transportation through market-based tolls rather than taxes, particularly if they can be franchised off, so the market aspect of this may be a good way to get some GOP support (or at least give them political cover with the lunatic fringe). Where’s a gas tax increase? Hasn’t gone up since 1993 and has been eaten by inflation. This is all fine and good, but you noted that none of this is going to happen. Any idea as to what we might end up with? I feel like the tolling might be a popular option, even with the GOP, especially if that money is going directly to state DOTs. @disqus_MJiyiDjPS8:disqus The broad consensus is that there will be no bill before the MAP-21 expiration deadline (or, more pressingly, the HTF-runs-dry deadline). People think Congress will find a few bucks to fund a short-term extension and get past the elections. @rgbose:disqus We have the same question. @fakeymcfakename:disqus remember that this bill wasn’t constrained by the House GOP or anything else — it’s an administration fantasy. Maintenance tolls don’t have to be expensive for regular Interstates, though new toll projects would likely include new lanes and especially (and in some case badly needed) completely new interchanges that optimize flows between existing Interstates. With cars getting more fuel efficient by the day, why not user fees instead of gas taxes? I’m all for tolls,. Inflation has been a much bigger affect on declining gas tax revenues than higher fuel economy. Don’t forget declining Vehicle Miles Traveled too. In fact it’s a great thing that fuel economy of lighter vehicles is getting better since it puts a higher ratio of gas tax revenues onto the big vehicles that do most of the damage. Also most local streets in cities aren’t paid for by gas taxes or tolls so again better that fewer gas tax revenues are coming from the vehicles that frequent them. It will destroy our nation. I don’t think that new interstate tolls would fund the bill – they would just allow states or regional agencies to collect additional revenue, if I understand correctly. So you want some central planning authority tracking and logging everywhere you drive? This is a poorly thought out bill like “Obama care” …. 1.25billion $ for bike paths doesn’t sound too bad , that would be about 25 sow missiles for the navy or 100 sow missiles over 4 years … There are a lot of general claims and statements , and perhaps this money could be set aside for future use , whit b would allow the current budget to flex and other programs to borrow from each other as neccissary .